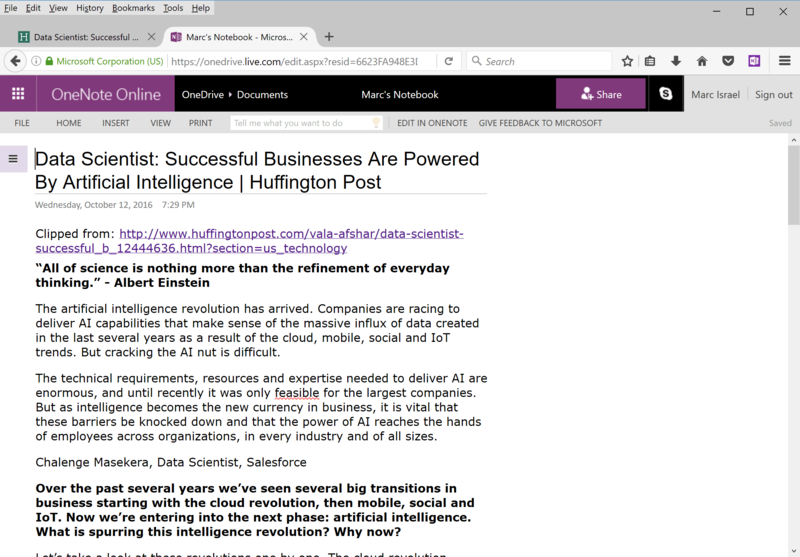 If you are a OneNote user, you will, someday, definitely need to copy and paste information from a web page. 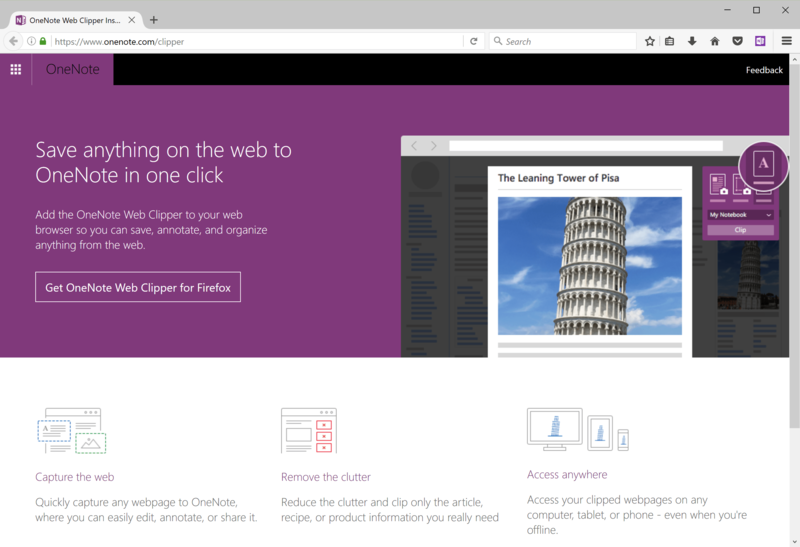 Although the good old Ctrl+c – Ctrl+v (copy and paste) works, there’s a better way to clip a piece of a web page to OneNote: Clipper! 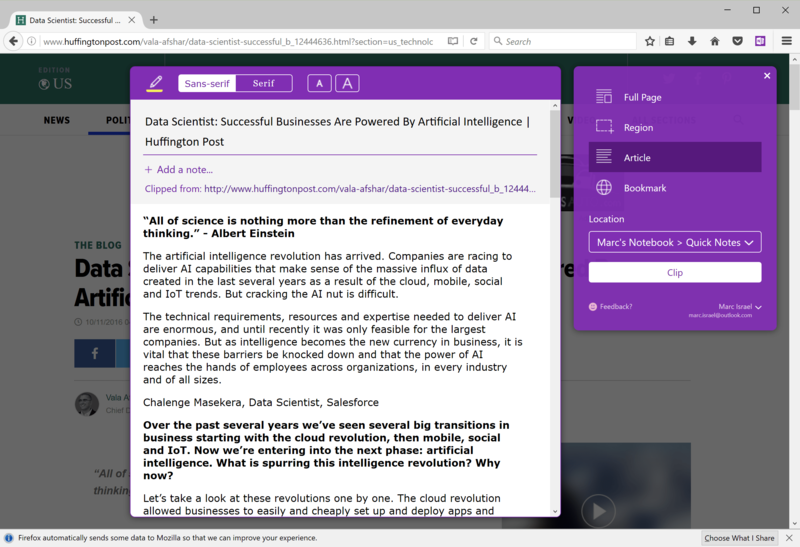 OneNote Clipper is an add-on to your web browser that allows you to copy and paste a web page or a piece of it right into OneNote. It exists for most browsers, including Safari, meaning, yes, it works on a Mac! (Sad though it does not work on Opera). For Windows 10 users: if you are using Microsoft Edge, you will need to update to Windows 10 Anniversary Update to have the Edge version that allows extensions! With one or two clicks, select what you want to copy – in the example above, the article – and where you want to copy it – which section in which notebook, then clip it! 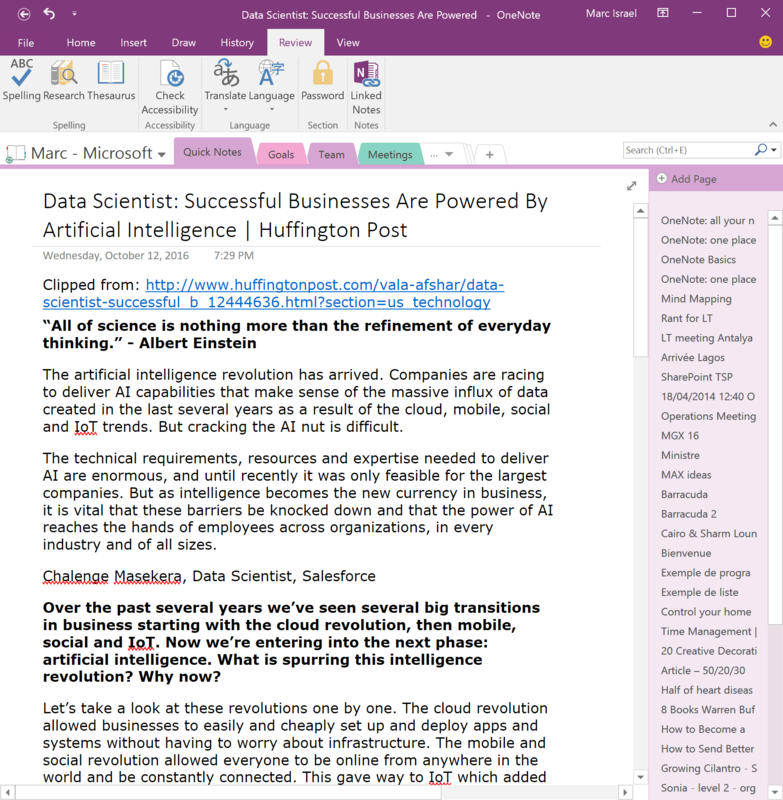 You now have this article in OneNote as shown below. How do you get Clipper? Nothing simpler! 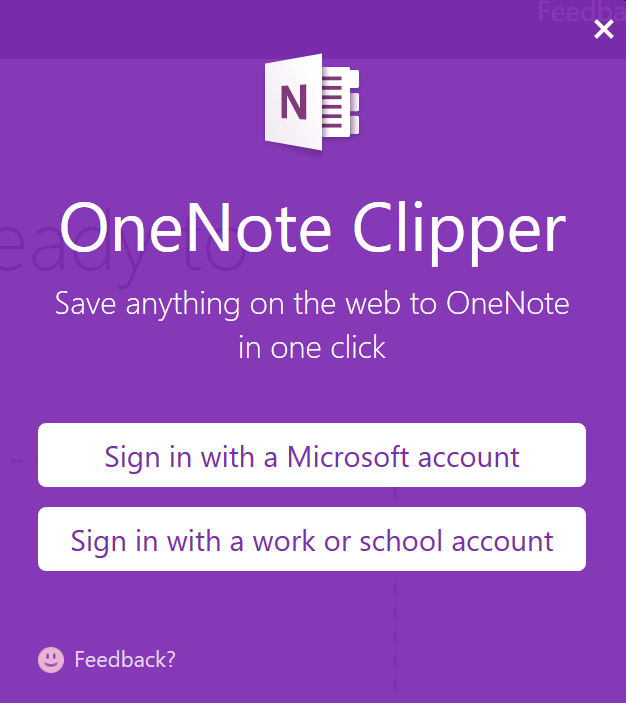 Go to onenote.com/clipper and click the button Get OneNote Clipper. The setup procedure depends on your browser, but should be fairly easy to follow. Seconds later Clipper is setup in your browser. 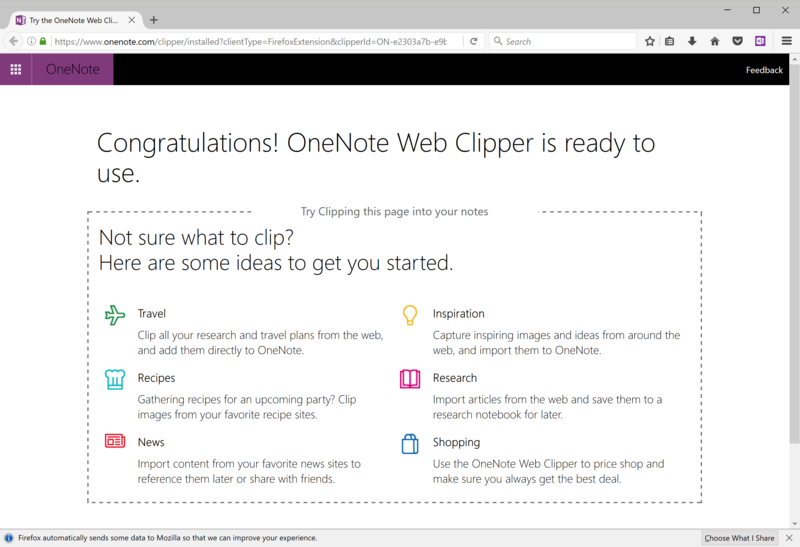 The last step is to get identified so that Clipper gets access to your OneNote notebooks. Click on the Clipper button or link (for IE), then choose to sign in with a Microsoft account or an Office 365 one (provided by your work or school). One signed in, you’re good to go! Once setup, Clipper is accessible through an add-on (in most browser) or a link in the Favorites bar in Internet Explorer. Below is the Clipper add-on icon in Firefox. You can immediately view the result in OneNote by clicking the View in OneNote button. This will open a new tab in your browser and fire OneNote Online. After a couple of seconds, or minutes depending on the speed of your connection, the page will appear on your local OneNote. 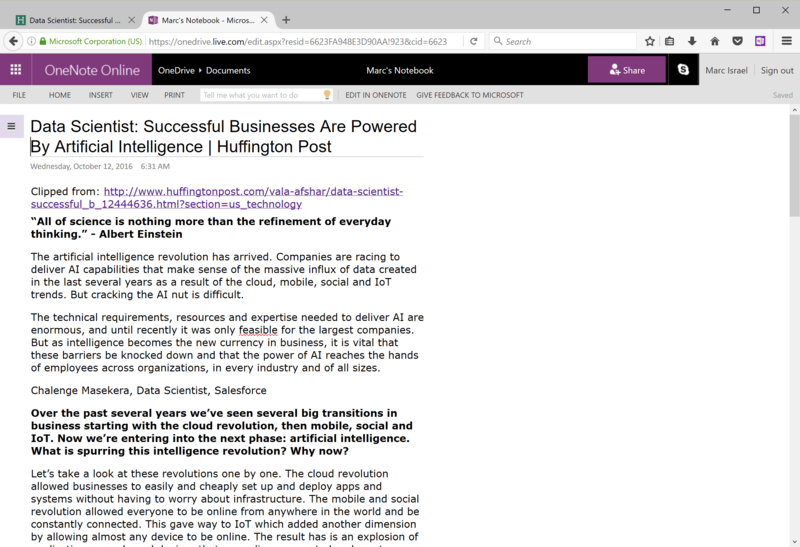 If you have this OneNote notebook on other devices, they will all synchronize and you’ll be able to read your article offline at any moment on any of your devices. 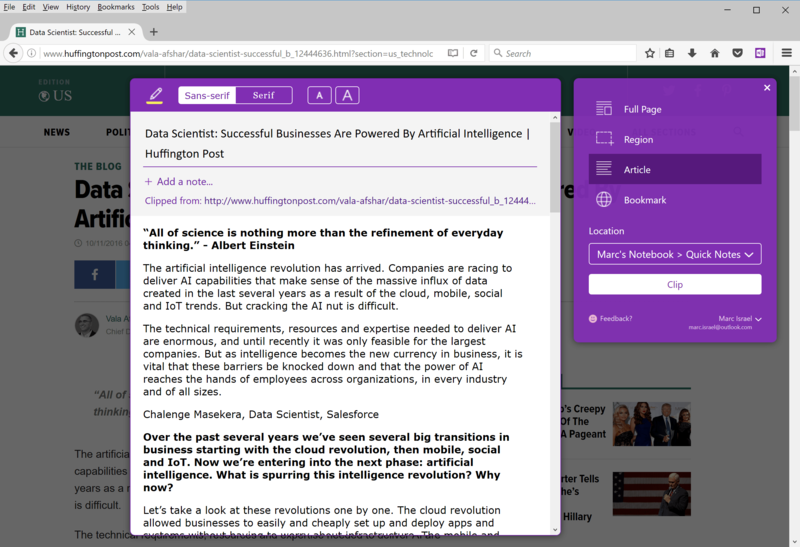 To conclude, the OneNote Clipper is a simple tool that allows to quickly paste articles or web pages directly to one of your OneNote notebooks. Since it exists for almost all browsers and platforms, it would be a pity not to take benefit of it if you are a OneNote user, which I deeply encourage you to become! When this function was on Android device?